It's that time of year when many of us begin to think of calendars, schedules, and diaries for the new year. Today's book, The Kitchen Diaries: A Year in the Kitchen with Nigel Slater, is a great book to consider starting to read in the new year. Nigel Slater is a very gifted food writer. As the cover to The Kitchen Diaries says, Nigel writes "about food in a way that stimulates the imagination, the heart, and the palate all at once." Nigel has written several cookbooks (including a favorite of mine called Appetite) and writes a popular column for the UK newspaper The Observer. The Kitchen Diaries is exactly what it says it is: it's a record of what Nigel cooked and ate for one year, complete with recipes and mouth-watering pictures. The book is broken down into months, so you can either read the book from cover to cover, or just glance at the current month's recipes. 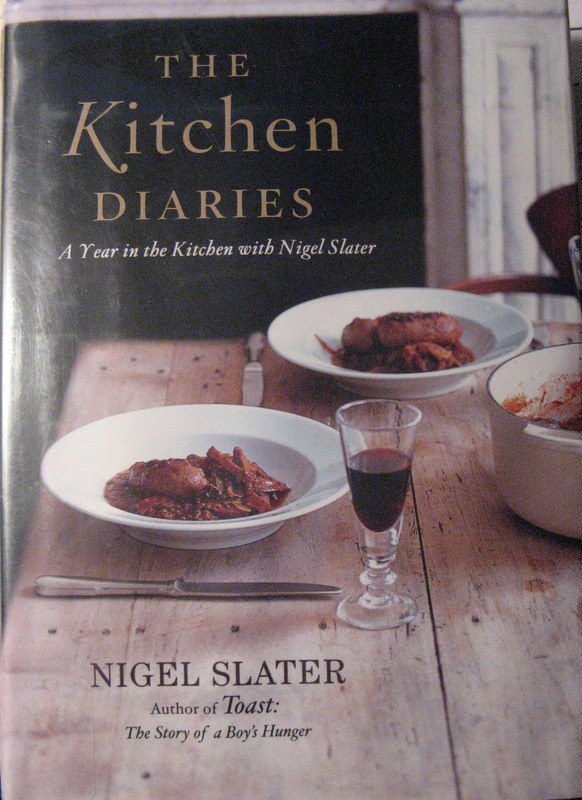 Of course Nigel is a big fan of seasonal cooking, so this doubles as a seasonal idea and cookbook. Even if you have no intention of cooking any of Nigel's recipes, this book is still a good read in terms of food descriptions. I decided on an Herb Butter for Grilled Chops which comes from the January section. The recipe calls for blue cheese, which is taboo when one is pregnant, so I had to forego it in place of feta. Next time I would try substituting and herbed goat cheese. But, I'm also going to try it again sometime when I can eat the blue cheese! Being winter, I didn't want to grill my pork, so I seared it in a pan and then transferred it to the oven to finish cooking. "I make a quick herb butter with equal amounts of blue cheese and butter (I use 1/2 cup of each), mashed with a tablespoon each of fresh thyme leaves and Dijon mustard, then stir in a couple of Tablespoons of heavy cream and a grinding of black pepper. 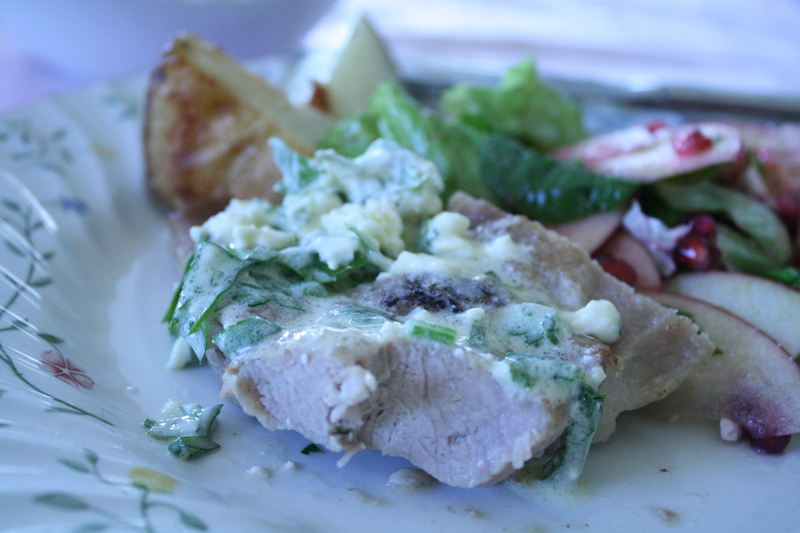 It sits in the fridge till supper, when I lay thick slices of it on grilled pork steaks. The cheese butter melts over the charred edges of the chops, making an impromptu sauce to mop up with craggy lumps of sourdough bread." Yum, all those recipes sound delicious. By the way, there are several types of blue cheese made with pasteurized milk that are safe during pregnancy, just check on the package for the ingredients (my favorite store brand, Rosenborg, is made w/ unpasteurized milk, unfortunately). But if you are using it for a recipe maybe you could find one that would work. Same thing with goat cheeses - some are made with raw milk and some with pasteurized.